Towards the Advancement of TIMD Japan & the Accomplishment of Vision 2020 April 26, 2015. The 3rd national meeting of TMD black belts and instructors in Japan was held last Sunday, April 26th, at the Suzuka Youth Civic Center in Suzuka City, Mie Prefecture. 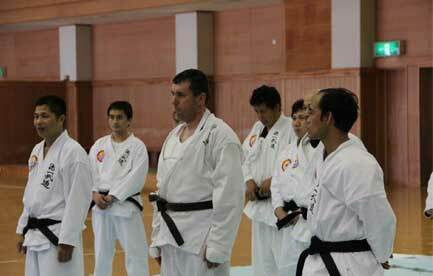 The meeting was attended by main instructors coming from the east, central and west Japan. Presiding the meeting was our very own International Instructor and President of Japan Tong-Il Moo-Do Federation, Master Takamitsu Hoshiko. 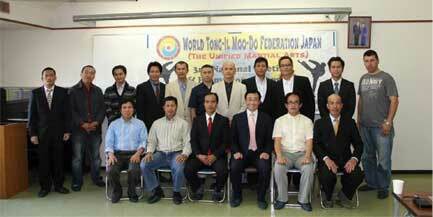 Head Instructors, Master Robert Alcamfor, Master Jerry Baysa, and Master Rafael Ablong represented the east, central and west Japan Tong-Il Moo-Do Federations, respectively. 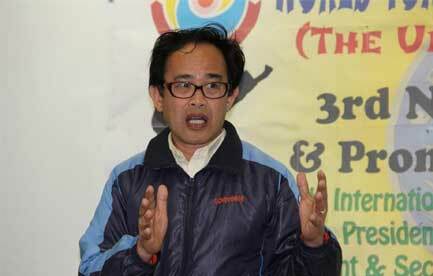 Master Ganilico Jumawan Jr. acted as the main facilitator of the whole event. He spearheaded the efforts to prepare for the quarterly event together with his wife, Master Jerry Baysa, black belts and the wives of other masters in the central district who came to support the event. Those who attended the meeting and promotion test were: Robert Alcamfor, Isaias Florentino, Arnold Heramis and Joel Arias of east Japan; Jerry Baysa, Joelimar Juliano, Jun Jumawan, Roy Carumba, Bienvenido Denajeba, Jamie Benga, Benedicto Aguilar, Albert Hangalay and Rolly Barili of central Japan. Master Hoshiko, Raffy Ablong, George Badea and Daniel Badea represented west Japan. Master Reynaldo Gloria was not able to attend because he had an operation on his leg the day before that and Master Dante Negre had to follow his company’s orders to finish the yearly physical check-up to continue his employment there. The whole day event was divided into two parts. The first was the formal opening and report, that was held at the youth center from 8:00 a.m. until 11:15 a.m. It included the welcome message, the Japan TMD president’s report, and the awarding of promotion certificates to black belts who have continued to practice and teach the art since they came to Japan. Some black belts who have not been promoted for decades and years were strongly encouraged to see or receive their higher degree certificates along with the new identification cards. This is to also to encourage them to practice for physical health, sp@irtual strenght and for the promotion of TIMD in their respective areas. The second part of the day’s event, include the movement of people and equipment to the Budokan Center at another place in the city. Everybody took their lunch in the grounds of that center before the physical preparations for the promotion test at 1:00 p.m. The promotion test of George Badea, who works for the Fukuoka International School (FIS) and assists Master Raffy’s martial arts class there, also served as an overall assessment of those who were promoted to 2nd, 3rd and 4th degree black belts. In his welcome message, the VP/Secretary-General of Japan TMD Federation, Master Rafael E. Ablong, emphasized from Dr. Sun Myung Moon that "even when we reach our fifties or sixties, we should not expect to take things easy because our bodies are not what they used to be. Rather, we should work harder to make the most of the time that remains." 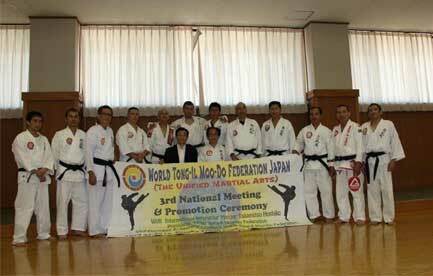 He said that the next meetings should be to train and update the forms and techniques of black belts in Japan including the PowerPoint presentations of the TMD philosophy. For now, national meetings will be held in central Japan because of its proximity to east and west regions and the amazing capability of its staff and resources to support the quarterly meetings. 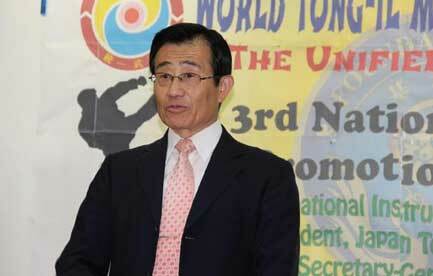 President of Japan Tong-Il Moo-Do Federation, International Instructor, Master Takamitsu Hoshiko delivered his world report and inspirational message at the formal opening of the 3rd Annual Meeting in Suzuka Civic Center Center in Suzuka City, April 26, 2015. Master Takamitsu Hoshiko updated the instructors about the latest news and information around the world especially about the successful holding of the TIMD Referee Workshop Level C and World Leaders Meeting Report in Iran that was initiated and hosted by Iran TMD Federation headed by Master Majid Salari, the continental leader of the Middle East. His message strongly encouraged and raised the motivation of everyone to become more actively involved in practicing, teaching and promoting the art. After his report, he awarded the certificates of promotion to black belt instructors in Japan who have met the requirements. The promotion test of George Badea highlighted the afternoon event. He performed and answered questions about the meaning of the forms and some basic points in the TIMD philosophy which was written weeks before that. He fought successfully against 21 people. He is a very good and skillful fighter. Even though he needed a lot of strength and stamina to continue and thought of stopping or changing with his brother. Georg never gave up physically and together with the spirited encouragement of the older black belts, he was able to finish the 21 fights. In the end, he and his brother said that they want to be with this group. Mr. George Badea (center) attends TIMD classes at Fukuoka International School three times a week and at Takamiya Dojo twice a week. He has also participated in trainings and demonstrations in Fukuoka, Kurume and at FIS before this promotion test. At the concluding message, Master Hoshiko emphasized the need to follow our founder, Dr. Joon Ho Seuk’s guidance to all practitioners of TIMD: check your skills and your understanding of TIMD Philosophy, check your character & how much you contribute to development and advancement of TIMD. Master Raffy aptly and quickly reminded everyone that the best fighting spirit is the spirit after the fighting. To end this 3rd All Japan National Meeting, the participants agreed to meet in July 2015 to train and map out clearer plans to achieve for Vision 2020 before posing for the final group photo. Our deepest thanks and gratitude to our President of Japan TMD, International Instructor & Master Takamitsu Hoshiko, for sharing his important time with us. For the twins, Daniel and George Badea, who came all the way from Romania to train, drive, feed and join us. My deep thanks and gratitude to our black belt brother and Master Jun Jumawan for leading his family federation members to help us organize this important meeting and to Master Jerry Baysa, central Japan regional TMD leader for helping organize it. Thanks to our very strong, loyal and indispensable masters from East Japan led by Master Robert Alcamfor and Master Isaias Florentino, Arnold Heramis and Joel Arias who came by car after a hard days work and a long, overnight drive to the meeting place. To everyone, thank you for everything. See you in July 2015!